If you’re anything like me, you come back from a Professional Learning workshop or conference just bubbling with ideas to try with your students, teammates, or school. Just because you are excited and wanting to delve head-first into the new changes, does not mean that your students, teammates, or school environment will be as willing to experiment. How, then, do you lead and encourage change that you know will make school much more enjoyable and meaningful for the members of your school community? Mindset by Carol S. Dweck, Ph. D.
Hard work and targeted practice are what ensure meaningful growth. Start small. The larger the group, the more challenging it can be to encourage and sustain a change in culture from one focused solely on the “end result” and not the learning process. That said, if you work to get your teammates or students aboard with trying new things, failing, and trying new things again, you will be more likely to inspire others to do the same. Feel free to check out the Canva presentation I used in this session and let me know your thoughts. What are some things you would like to explore within your community? Looking forward to seeing what you choose to explore this year! First and foremost, the HOVERBOARD! Imagine the students walking into a room with what looks to be a skateboard with no wheels sitting on the floor. It would have wires, magnets, and circuit boards attached to it haphazardly. After having the students write one paragraph in their STEM notebooks (because, of course they would have notebooks), hypothesizing what it is that lay before them. Then, I would provide a brief explanation…visually. 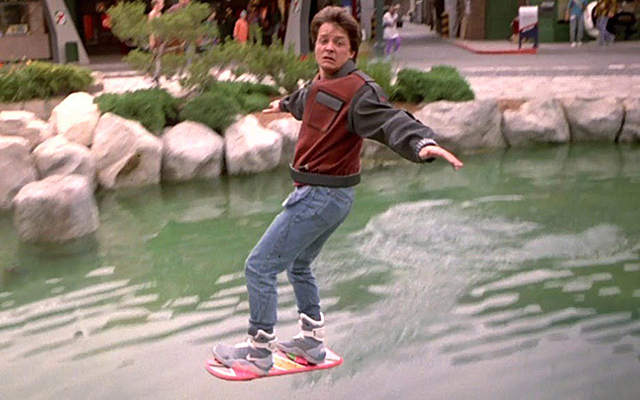 I would play a video clip of Marty McFly zipping through the future on his hoverboard before having the students divide up into groups. Each group would explore the modern attempts made to create a hoveboard by Lexus, Omni, and Hendo. Each group would first identify their overall thoughts, observed pros, and observed cons of the hoverboard they researched, they would then share their thoughts whole group. The students would then compare and contrast the examples presented and use that to help them create their own brand of hoverboard. If I were an Art teacher, I would use Back to the Future Day to explore the concept of modernity as it has been shown in art. The classroom would be set up much like a gallery, but with iPads placed around the room, to showcase the work of artists from the 1950s to today. After this gallery walk. the students would then watch a short scene from “Back to the Future Part II” and use that, plus one of the artists they observed in the in-class iPad gallery walk, to create their own work. Their own work could be inspired by the artist they chose in the movie or it could be a rendering of how they imagine the future. An alternate version of this lesson would employ some car design, where the students would learn about the DeLorean Motor Company, its rise, its demise, and its rise to iconic status. They would then design their own cars that they think could also become iconic. Class would start with the students walking into the classroom decorated to look like it was the Wild West (or the mid-1800s). With the student desks in groups, each group would feature a metal bucket with rolled up maps placed inside. Of course, I would not answer a single question about the maps until the right time. In the movie, Marty McFly does not change geographical locations as he and Doc Brown embark on their travels, but in time. With this in mind, I would have the students watch a brief clip showing when Marty and Doc are transported to two distinct placements in time. Thereafter, the students would be presented with maps of the school’s community. They would work in groups to identify which maps were from today, which came from ten years ago, and which came from fifty or one hundred years ago. They would make observations about these changes and pair this with their prior knowledge to identify potential reasons (other than population growth) for the changes in the community’s layout. I absolutely LOVED teaching English Language Arts because any of the lessons here could be used to teach literacy, grammar, audience, tone, etc., etc., etc. Um, no ma’am. Math is not in my wheelhouse. That said, perhaps I would challenge the students to identify places within the film where math would have had to have been used. This film would pair so nicely with others that predict the future such as the “Terminator” films, any “Star Trek” or “Star Wars” film, “Mr. Nobody,” or even the so-called first science-fiction film “Metropolis.” I would embark upon a whole unit or section of study on films that focus on the future. The students would be invited to consider the historical context in which the films were made, the genre of films they explored, as well as the features they found made some versions of the future more believeable in some films than others. Alas, I am no longer in the classroom on a daily basis, but I know many awesome educators who would be willing to create crazy connections to days like today. If you are such a teacher, please do not hesitate to use the inspiration above to make some classroom magic happen! If you do, please let me know and I would love to come to see it in action. If you’re to afraid to do so, I’ll gladly come to your room to co-teach with you for a day (seriously). While I cannot tell the future, I think its safe to say that ultimately a fun classroom is one where students love being and one in which we educators love working. art Dream Lessons Film Film Studies Language arts Movies Social Studies STEMLeave a Comment on Back to the Future Day! instantaneously over the internet. New species of plants and animals are literally being discovered daily. Beyond this, the Okeanos Explorer, this NOAA exploration vessel, is also working with multibeam sonar to map the ocean floor. In this all-day workshop, my colleagues and I built a model that mimicked the multibeam sonar’s capabilities, constructed a hydraulic robot arm, and tested water for its temperature and pH to better understand how the Okeanos Explorer carries out its duties. As an added perk, I was able to see the majestic Beluga Whales as well as the Whale Sharks suggests afterwards. It was certainly a Saturday well spent.